Bringing yoga and meditation into your office can help your employees focus and rejuvenate so they work smarter and team moral is lifted. Yes, yoga can bring more happiness into your workplace. Happy employees who feel better also take fewer sick days and employee retention can be boosted. After class at the Alibaba Bellevue office. Just me and Taobao now! Yoga in your work clothes? Have a gym in your office? 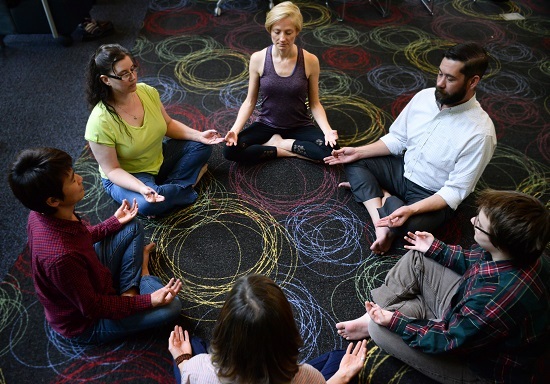 Why not offer full yoga and meditation classes for your employees at various levels? We offer 3 office yoga and meditation class types. Which one is right for your and your business? "I've participated in three office yoga sessions with Nadine and each one has greatly improved my day. She is very skilled at adapting the class to the needs and vibe of the participants, and pushes us just the right amount. She also navigates the awkward office setting with grace!" "Nadine's office yoga classes are accessible and adaptable. She brings a vibrant and positive attitude, and meets all participants needs where they are. She has a consistent flow while her content varies from session to session. Thanks Nadine!" "Office yoga sessions with Nadine were my first ever yoga experience and a truly amazing one...Each pose is explained in details and variations are provided for each skill level. Ability to practice yoga without mats and to stretch after a long time behind a desk is such a wonderful opportunity in the office. Cannot wait until the next session every week..."
Interested in feeling better and rocking your workday? Subscribe! Sign up to receive "10 Ways to Rock Your Work Day" which also includes Tip #5 with five yoga poses and demo images you can do in your office. You'll also receive a monthly blog post with news and updates! Find updates, wellness and yoga tips and more!